What is a chatbot ? A Chatbot (or a bot) is a software developed using the concepts of artificial intelligence (AI). It can initiate a conversation with humans (users) in natural language through chat (messaging) applications, mobile apps, websites, or through telephones. A user can ask various questions to a chatbot or give commands, and it replies to the action requested. Chatbots are considered as the speakers for artificial intelligence (AI). They’re an accessible form of AI and widely used in various business platforms across the world. They are commonly implemented in different chat mediums such as chat windows, SMS, social messaging services across platforms like instagram, twitter, and facebook: to send and receive messages. What are chatbots for ? Chatbots are the most advanced and expressive communication softwares that interact with humans. Technically, chatbots usually represent the traditional Questioning and Answering system. Get ahead in your career by learning Artificial Intelligence through Mindmajix Artificial Intelligence Training. These are being used as assistants to consumers for shopping online, either to answer about products or to provide useful information for the consumer who searches for shipping price and availability. These are generally used in service related sectors for providing services by answering repetitive requests. If a conversation gets complex, then they will hand over the request to a human service agent . How to choose a right chatbot application? There are many platforms and tools available for you in the market to develop chatbot applications. Based on the use cases you need, you can opt some chatbot technologies which are appropriate to your application. To achieve required results, having an understanding of different combinations of AI technologies such as semantic, natural language processing, and machine learning is suggested as best option so that you can evaluate them for your desired goals. The data that is stored in enterprise (business) systems. A text retrieved from a knowledge base. A predefined and generic text. The result obtained by interacting with one or more back-end applications. A contextualized information provided by user. A chatbot that answers a user’s request should be smart enough so that it can engage the user to continue the conversation. It doesn't have to remember all the conversational details. Entertainment bots : One way to assess these bots is the Turing test, i.e., comparing them with humans and the other ways are metrics, quantitative, assessing the minimum length of conversation between the bot and the user, and maximum time spent by a user. Based on the metrics we can decide what kind of a bot is it? For example if conversations are found to be short then the bot is not considered as an entertaining one. Business bots : Often, businesses are transactional, and have a specific purpose. In this kind of chatbots, conversation is focused much on users’ needs. For example, chatbot developed by travel business companies like Trivago, Makemytrip, Goibibo will provide an information about hotels, flights, tours, and help in finding the best packages according to users preferences. The examples of business bots we regularly use are - Uber bot takes a ride request, Google Assistant readily provides information requested, and so on. Number of users who reached the goal. Whether the user found the information he/she was looking for? Is the booking successful or not? Has the user bought products with a proper guidance? There are three types of models in developing chatbots. 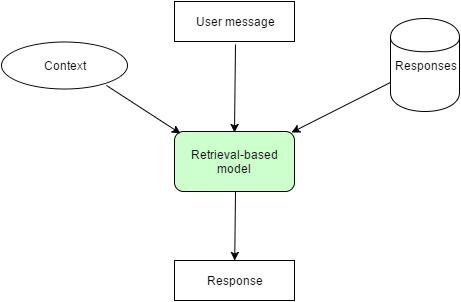 Retrieval-based models: These models are much easy to build and give more predictable responses. These are not 100% accurate in providing responses, but you need to make sure that there are no grammatical mistakes in responses. These are more practical, and many algorithms and APIs are available for developers. They make use of context in conversation for selecting the best response from a predefined list of messages that they got trained. The context includes all previous messages of conversation, and earlier saved variables. The bot that doesn’t use context is stateless. So, it will provide response only to the latest users message, omitting all the previous chat history of the conversation. Pattern-based heuristics: These are for choosing a response, and it can be done in many ways, based on machine learning classifiers to simple if-else logical conditions. Here, uncomplicated technology is used to set of rules, using patterns. This type of models are very popular for entertainment bots. AI and ML programming languages are widely used for response templates, and writing patterns. Developers write code using both these languages, and code can have multiple units. When a developer receives any message, it checks all the patterns till it finds a correct pattern which exactly or nearly matches user message. If the match is found, then it chooses that template to generate the response. ChatScripts are the modern implementation of this kind: It is an open source chatbot engine that allows to define a chatbot in a rule-based language. Generative models: These models are the base for future chatbots, and they make them smarter and more interactive. These models are not widely in use, and are mostly in developing stage. A chatbot can deliver the same message through different words. For example, a weather bot that can predict response in different ways to different users like “It’s going to rain”, “do carry umbrella today”,“Probability of rain is 50%”. the language or the user’s input? As different users prefer varied styles of responses, bots analyze the previous data and metrics to produce response to the user. They can have independent response selection, and response generation modules. Processing the message starts from understanding, “what the user is talking about ?”. Generally, more sophisticated bots identify multiple intents in a message. Intent classification makes use of context information, like user profile, preferences, and previous messages. The weather bot can access the details like location and date to forecast weather. 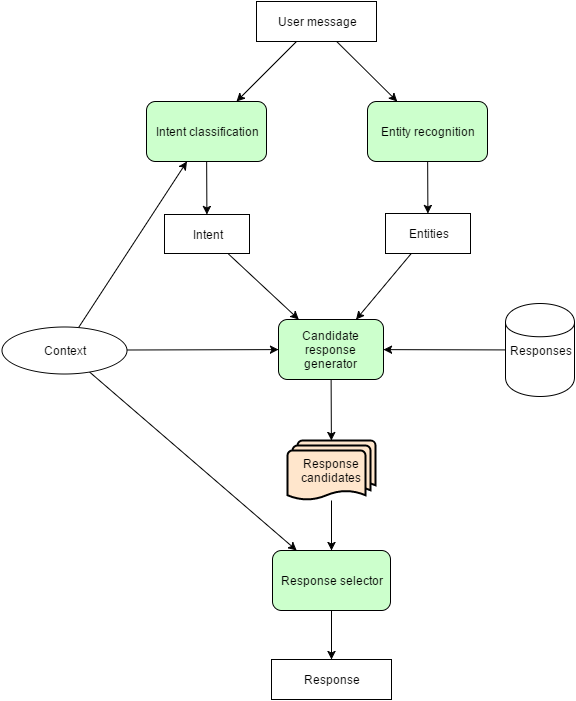 Candidate response generator: It does all the domain-specific calculations required to process the user request. It makes use of different algorithms, by calling few external APIs, or even takes the help of human to generate response. Final result of these calculations are listed as response candidates. These responses must be accurate according to domain-specific logic, it can’t be just a set of random responses. 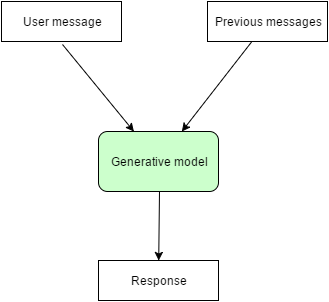 Response generator should use intent, context of the conversation as well as entities that are extracted from the previous user messages, or else it can’t support group conversations. The role of response selector is to just rank all the response candidates, and selects a response which best suits the user’s request. Currently there is a constant focus on improving the ability of chatbots to imitate the use of speech and meanings: Best example is “Cleverbot”. We are in an era where consumers are always connected to social media platforms through smart devices. The new generation of consumers expect quick and supportive customer service experience from various brands. They demand quick responses which are more personalized with recommendations. To fulfill their demands and to address the heavy competition in the business world, they focus to build chatbots that can manage customer queries 24*7 without any delay. Reality is that, they engage the consumers at the right time, with the appropriate information which is cost effective. It acts as interface between customers and brands and build trust in them. How advancement in AI impact Chatbots? Till now, chatbots haven't passed the Turing test. But there is a development in AI technology - data has become less complicated, and key for that is to find use cases from where we can get a huge volume of iterations(repetitions), so the system can iterate as fast as possible to improve itself. In the development of a chatbot, this is the main advantage as it can perform massive level of conversations. Still, research is under process about the evaluation procedure of the response. We can predict that in the years to come, we will see more advanced AI techniques coming into limelight that can provide more innovative features. The conversational capability of chatbots is always the main motto. 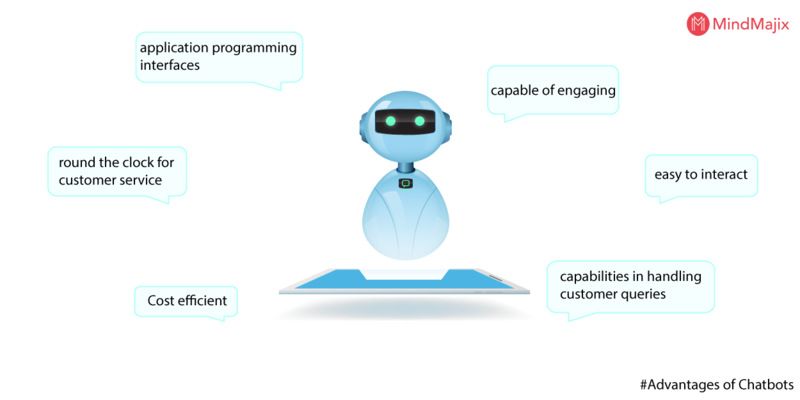 Following are different types of chatbots differentiated based on their features. Scripted chatbots: This type of chatbots follow predefined conversation paths. At every step of the conversation, the user has to select from the given options to decide the next step of the conversation. The options are given to the user at every step of the conversation, to choose either touch, text, or voice response based on the features of the chat platform you use, and the way bot is designed and programmed. Intelligent chatbots: AI allows flexibility in terms of the input from users that is acceptable. They take free input in the form of text and voice statements. However, AI works well with limited knowledge domain sets or instructions as the actual intelligence is limited. It is highly difficult for a bot to “understand” ambiguity or a useful memory that impacts the communication. Application chatbots: Both intelligent and scripted chatbots have graphical user interfaces (GUIs). Application bots are a combination of both intelligent and scripted bots. Chatbot developers need to understand the fact that the bots interact using a graphical user interface. If a user has to do the job, then he needs to do it more efficiently than the bot through a graphical user interface. Chatbots are used in different ways, that is why it’s difficult to define what they are. It is possible to write a use case for a chatbot for every single business or an organisation, which uses apps or a website. Examples of chatbot applications with possibilities are: To get a quick response to queries, to solve problems or complaints, etc. All the below chatbots allow the involvement of human agents in the conversation if required, may be as a premium service. Restaurants having takeaway facility where customers order through a chatbot, either in the store or from home. The best examples for this kind of bots are online food ordering apps such as swiggy, and zomato. Marketing or campaign sites which promote their products by conducting quiz to their customers and allows them to play the quiz using a chatbot. Chatbots help customers to purchase through ecommerce apps such as Flipkart, Amazon, and many more. A chatbot that responds to customer services enquiries and helps them in performing various tasks. They are used in monitoring customers satisfaction. They are used in airways to book flights and receive information which is relevant when they are in the airport. The advantages of chatbots are as follows. A simpler interface makes it easy to interact. They have extraordinary capabilities in handling customer queries. Work efficiently round the clock for customer service. Cost efficient and are easy to build. The use of chatbots has certainly gained strength over the past few years. At present, it appears that virtual reality, and augmented reality will play an important role in software development. Therefore, chatbots will definitely have a role to play here, especially in voice interfaces. There is no doubt that they are going to be the future. When more and more companies start developing APIs to integrate chatbots within their ecosystem for communications, then there exists a demand for bots that can interact among multiple platforms. Therefore, we can expect a rise in SDKs, and frameworks that help developers in building API-driven voice bots. Companies are now expected to engage bots to converse in the same way that customers would like to communicate with their family members, friends, and even colleagues. Since the maximum number of bots are trained by a strengthening voice-to-text, and natural language processing (NLP) which can be applied to any medium for communication, many brands, for example, Facebook Messenger, WhatsApp, voice-chat or messaging now have an opportunity to offer the choice of preferred messaging channel for their customers. Chatbots have bought a new revolution in terms of communication, and the way of interaction has entirely changed. Companies have inculcated these to establish conversation with their customers, and we are only at the beginning. Chatbots will take the customer experience to a whole new level in the future that builds more meaningful and long lasting relationships.